The study examined five dependent variables that were likely to be good predictors of college application rates: gender, socioeconomic status, GPA, number of years of using Naviance, and the average annual logins to Naviance. Findings indicated that the average number of times a student logged into Naviance accounted for the largest variance in the college application rates. This article is evidence of the use of Naviance as a promising practice in the implementation of ESSA College and Career Readiness Indicators. 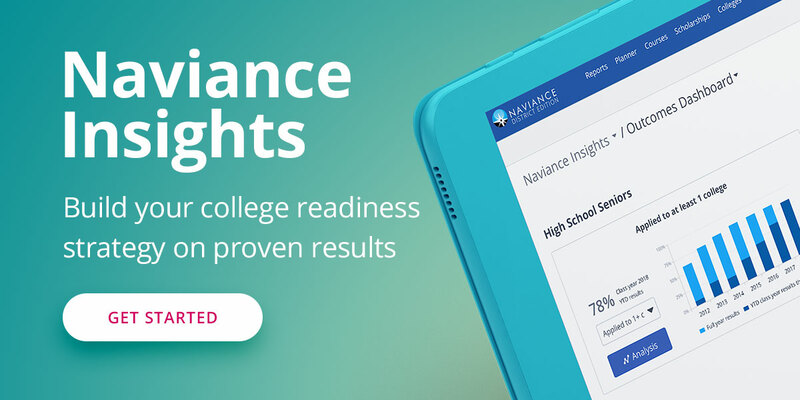 Naviance is used nationwide to plan, implement, track, and report indicators and activities related to college, career, and academic readiness in middle and high schools. Christian, David; Lawrence, Amy; and Dampman, Nicole (2017) "Increasing College Access through the Implementation of Naviance: An Exploratory Study," Journal of College Access: Vol. 3 : Iss. 2 , Article 4.